It’s possible that I have a slight Chinese food addiction. Day or night, high-class or Panda Express, I could eat it for every meal for weeks before getting sick of it, both because of the never-ending variety and the complete lack of need for any type of dishes (because hey, I’m in college! I reserve the right to eat straight from the carton). If I haven’t been to the grocery store in weeks or class ran long and I’m too hungry to make a full meal, I can always call up my local restaurant (on speed dial, of course) and have dinner there in no time. No matter how deep my love goes, though, it’s an expensive and oftentimes unhealthy vice to have – when the woman at said restaurant knew my order by heart, I knew it was time for an intervention. That’s why I’ve taken to making my very own Asian-inspired dishes at home. Not only are they super quick and easy to throw together, it’s a cheap and healthy alternative to my beloved take out – no need to tip or deep fry anything. 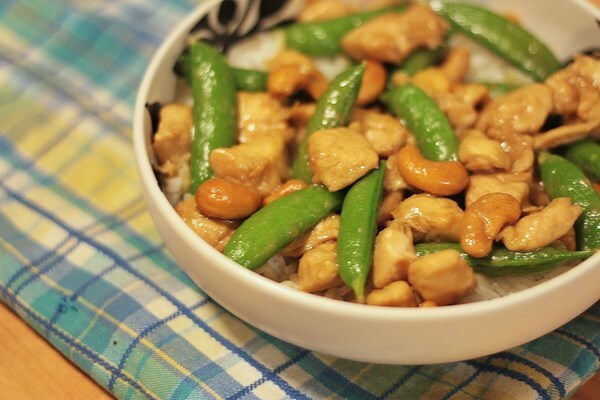 Like other home-cooked microwave meals I’ve talked about, this cashew chicken recipe is a one-bowl deal that is made completely in the microwave. I was skeptical of it at first, but for a 10 minute meal, it’s flavorful, filling, and made two large portions (a.k.a. tomorrow’s lunch). Only down side: no fortune cookie – I guess I’ll need to learn to make those next! Sarah is a senior at The George Washington University where she lives with four crazy girls that love to cook, eat and watch You’ve Got Mail as much as she does. She’s a member of the Taco Day! facebook group. In 2-quart, microwave-safe glass baking dish or bowl, combine chicken, garlic, soy sauce, sherry, cornstarch and ginger. Microwave the oil in a separate small bowl for 15-20 seconds until warm, then pour into the baking dish over ingredients. Stir to combine. Microwave on HIGH for 4 to 6 minutes, stirring every minute. Add snap peas and cashews, and cover with plastic wrap. Microwave on HIGH 3 to 4 minutes until chicken is done and snap peas are tender; stir after 2 minutes. Let stand for 3 minutes before eating, and serve over white rice. Tip: If you don’t have sherry lying around – or live in the District of Columbia like me, where they’re not allowed to sell it at grocery stores – a dry white wine works just fine for this recipe (and you can drink the rest with dinner). This looks fabulous…so quick and easy. I can’t wait to try it! Oh, and by the way, I am not a college kid but as an empty nester these quick and easy ( dare I say healthy!) type dishes are exactly what I look for when searching food blogs! Annette–glad you’ve found something here you love! THIS WAS SO GOOD! I can’t believe how easy it was. It tasted exactly like the Cashew Chicken I get from my favorite Chinese place, only I can pronounce all the ingredients. I have a feeling I will be making this whenever I have a Chinese craving… which is quite often. Thanks for the great recipe!